1. Blender. 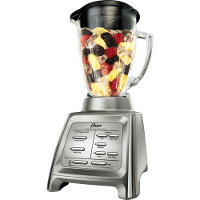 You don’t need a $500 blender! I use the Osterizer. I’ve burnt out a few cheaper models, this is the one that’s lasted two years and counting. It’s $60 and you can get it at any Walmart or Target. It can handle the load! 2. 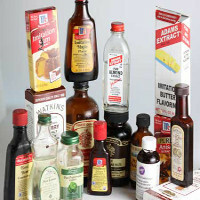 Flavored Syrups! 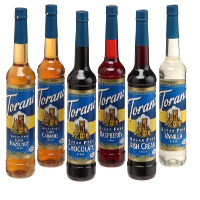 The best is Torani. They have a great flavor pack of 6 different flavors that will last you forever. Ya gotta have flavors without the calories, sugars, and extremely low carbs! These are the very best and dirt cheap. Take my word for it, get them on Amazon. 3. Extracts. Vanilla, Coconut, Hazlenut, Caramel, Rum, etc. Flavor, flavor, flavor. Need I say more? 4. Coconut Water. Make ice cubes out of it. If you don’t like coconut water, don’t bother. You can use oj, pineapple juice, etc. 5. 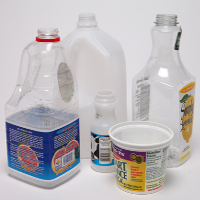 Juices, Milks, Yogurts. 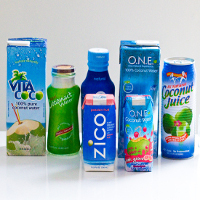 SUGAR FREE juices, FAT FREE milks and FAT FREE and GREEK yogurts! The flavor comes in the syrup and the extracts. 6. Protein Powder. YES, everyone needs protein powder. Unless you are a professional bodybuilder, YOU are definitely not taking in enough protein to maintain your muscle mass. Period. For protein powders I only will use About Time. 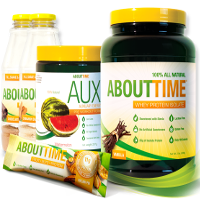 About Time is the perfect combination for us because it is only ONE product: Whey Protein! Not one other ingredient! Most other powders are chock full of everything else. And they offer a nice selection of unique flavors as well. 7. 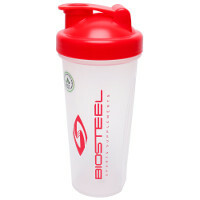 Shaker Cup. Have Smoothie, will travel. Take that smoothie to go! Made two servings and it’s only you? Want to make two save one? Shaker cups are indispensable. Buy one, on second thought, buy two! But, if you want to shop around, try to find one that is as close as possible to this nutritional content: 1 scoop–>100cal–>0grFat–>1grCarb–>25grProt. Go to your nutrition store to find the one that fits your needs the best. A privately owned one is better than a large chain store (sorry Vitamin Store, GNC). You are all set to go! 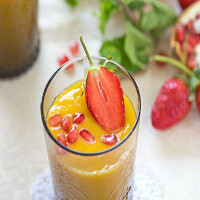 You now have the essentials to build fantastic tasting smoothies.There are endless possibilities and can be used as healthy meal replacements in sensible weight management programs. They are also fantastic as pre-workout and post-workout options. I HATE the billion dollar industry marketing all the quick fix garbage products espousing the latest and greatest protein shakes, bars, meal programs. Wellness is grounded in sensible meal planning with good wholesome food and safe regular exercise. Period! Blend all ingredients together BEFORE you add ice cubes! Eat Your Breakfast! At the end of this article I have a very special, easy to make killer cereal bar recipe you are going to love! Breakfast is the most important meal of the day. Breakfast provides you with the energy and nutrients that help you face the day. Breakfast helps increased concentration. Studies show that breakfast can be important in maintaining a healthy body weight. 2. Pick up portable breakfast items when at the grocery store. You should buy foods like fruit, low-fat yogurt, whole grain breakfast bars, or granola bars for those mornings when you have to eat breakfast on the go. 3. Replace or accompany that morning cup of coffee with a glass of orange juice or milk. 4. Make an omelette! You can shorten preparation time by chopping up your vegetables ahead of time. 5. Get up 15 minutes earlier. You can fix and consume a healthy breakfast in 15 minutes or less. 6. Plan ahead to eat breakfast. This means you should decide what you are going to eat for breakfast before the next morning. You can save time by putting out the box of cereal or cutting up some fruit the night before. Making sure your hands are greased with non-stick oil, or water, (because the dough is VERY sticky) , spread batter into a square 9 X 9 baking pan or dish sprayed with non-stick coating. Refrigerate for 3-4 hours, cut into 8 squares and enjoy! Smoothies are an incredible source of energy, well balanced nutrition. The key is to invest in a really good blender (and don’t whine about the price, you’re worth it). That’s a weapon that, if you use diligently, your body will thank you over and over for it! 1. Blend your non-frozen ingredients first. 2. Add any frozen ingredients. 3. Add the ice last so you can adjust your level of frozen goodness! 4. Finally, you can adjust the level of extract/syrup if you have too little sweetness for your liking. Now go out there and grab that day!